Smithiantha is a genus of terrestrial perennial plants with relatively large and stubby scaly rhizomes. The stems are erect with leaves often plushly hairy and attractively colored or marked. The flowers are produced in a terminal raceme, and are often large and showy in colors ranging from red to orange and sometimes yellow, with a variety of darker markings. It is distributed from Mexico to Guatemala, in forest habitats in the mountains, and is seasonally dormant. 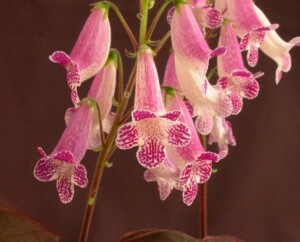 It has long been in cultivation as a desirable ornamental, and many cultivars have been produced.